The Girl Who Raced Fairyland All the Way Home is the last in a series of five and if you read it without reading at least some of the others, it will make no sense at all. It is a reunion and a race between all the friends and foes September, the Engineer, has accumulated throughout the rest of the series. She is reunited with Saturday, a blue Marid, who comes from the sea and lives his life in nonlinear time. He will be September's husband someday. Also, her friend A-Through-L who is half-Library, half-Wyverary, which is something like a dragon but without feet. And Blunderbauss, a giant Combat-Wombat made out of yarn. And many others. When I read the first book in this series, I instantly fell in love. It felt way more clever than Alice in Wonderland. Valente was taking Fairyland and running with it. It felt like anything was possible. The fourth book again had this magic. In it, Hawthorne, a Changelling, who is actually a troll growing up in our world has to figure out his way back to Fairyland. At the beginning of that book, it felt like Valente had gotten tired of the main thread of her plot and had gone off on a side tangent. But it turned out to be a very enjoyable side tangent. This, the completion of this series, felt like Valente wasn't quite sure how to end it. Wasn't September already crowned Queen of Fairyland when last we saw her? Why does she have to compete with all the other past Kings and Queens for something she rightfully earned? But there are enough twists and turns to keep the reader engaged and certainly some satisfaction and seeing all the friends together at last. 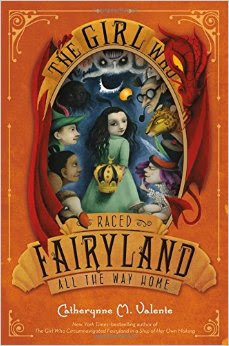 I can heartily recommend The Girl Who Circumnavigated Fairyland in a Ship of Her Own Making. If that captures your imagination, then rest assured there will be more to enjoy.